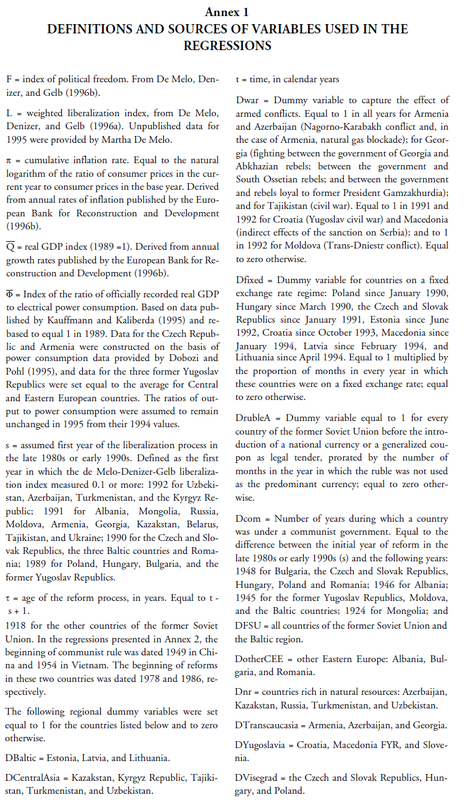 Recently a number of empirical studies have begun to analyze the evolution of output during the transition from planned to market economy in the countries of Central and Eastern Europe and the former Soviet Union.2 A number of important conclusions emerge from the analysis of the reform process, some of which are illustrated in Table 1 and Chart 1: (i) In its early stages, the process of liberalization and macroeconomic stabilization involves a large fall in output in virtually every country in the area.3 (ii) Initially, the fall in output tends to be particularly steep in those countries where the liberalization effort is relatively strong. (iii) After a number of years, however, the countries where liberalization was strong and early show the highest rates of output growth, and the smallest cumulative declines in output. (iv) There has been considerable underutilization of industrial capacity in the early stages of transition. (v) Although price decontrol initially results in a burst of inflation, over the medium term there is a negative correlation between growth and inflation, and also between liberalization and inflation. There is relatively little disagreement about these “stylized facts,” but a unified model that could explain them has not yet been provided. The empirical models estimated by Aslund, Boone and Johnson (1996) and Fischer, Sahay, and Végh (1996) illustrate several of the conclusions just noted, including in particular the inverse relation between output and inflation, and the medium-term positive association between output and liberalization. But these models cannot account for the fact that the initial fall in output is inversely correlated with the degree of liberalization (see Table 1). In fact, these models are unable to explain the relation between the time pattern of output during the transition and the timing and intensity of liberalization. In contrast, De Melo, Denizer, and Gelb (1996), De Melo and Gelb (1996), and Selowsky and Martin (1996) provide extensive empirical analysis of these factors, albeit without a formal theoretical background. The purpose of this paper is to specify and estimate a model that explains the behavior of output during the transition and its relation to the process of liberalization and stabilization, both in terms of the time profile of the key variables and in terms of differences among countries. In explaining the changing relationship between output and liberalization over time, the model emphasizes two elements: (i) the distinction between “old” goods and “new” goods and (ii) the role of underutilization of capital during the early phase of the transition. Inflation also is an important variable in the model. Indeed, macro-stabilization is seen as a critical element in bringing about the recovery of economic activity, both by reducing the chaos and uncertainty associated with hyperinflation and by reinforcing liberalization. The empirical part of the paper relies extensively on the liberalization index constructed by De Melo, Denizer, and Gelb (1996a) for the countries of Central and Eastern Europe and the former Soviet Union. The results show that the doubts expressed by Aslund, Boone, and Johnson (1996) concerning the usefulness of these indexes in explaining output growth do not appear to be valid. Also, this paper confirms the De Melo-Denizer-Gelb intuition that economic recovery depends on the duration as well as the intensity of the liberalization process. Finally, it illustrates the key role of transitional unemployment of capital in explaining the fall in production in the early stages of the transition, and it confirms the hypothesis that there has been considerable under-reporting of output in the official statistics, particularly in the countries of the former Soviet Union. The simplest version of the model, presented here for illustrative purposes only, assumes full utilization of productive capacity and no net capital accumulation. Domestic output is produced by two types of firms: type-B firms typically produce the “old” goods they were required to produce under the central planning system but for which demand falls as the state order system is dismantled and the economy is liberalized. Type-A firms produce “new” goods and services which they are increasingly able to sell for a profit as the economy is liberalized, and for which there is growing demand by consumers and by other firms that are increasingly free to purchase what they wish in free markets. It should be stressed that the two types of enterprises should not be classified rigidly in terms of the economic sector to which they belong (i.e., industry vs. services, or privatized vs. stateowned firms). Rather, enterprises are categorized as type-A firms to the extent that they have structured or restructured their production and modified their technology (defined in broad terms to include management, product design, and marketing) with the intention of selling at a profit in the market. In each sector, a production function relates output to the amount of capital used in the sector. where Ko indicates the aggregate capital stock just prior to the beginning of reforms. Conceptually, the variable L should capture the degree of privatization and market access, elimination of state trading monopolies, and liberalization of domestic prices and external trade. It is defined so as to range between zero and one, L = 1 representing a fully liberalized market economy. The parameter l indicates the extent to which the output of old firms contracts as the economy is liberalized—i.e., as L rises— and should also range between zero and one. As explained below, another relevant factor in this context is the extent to which the reduction in subsidies, centralized credits, and budgetary transfers associated with anti-inflationary macro-policies help to enforce hard budget constraints on type-B firms and force them either to cut production or to restructure and transform themselves into type-A industries. Assuming that before the transition starts output is produced by type-B firms only, the pre-transition level of output will be Qo = aB Ko. Thus, dividing through by Qo in equation (3) provides a simple equation for the ratio of current to pre-reform output. In this simple full employment model, total output always rises as the economy is liberalized as long as the marginal productivity of capital is higher in the new goods-producing sector A than it is in the old goods-producing sector B. Thus, this model explains why several years after the beginning of the transition output fares better in those countries where liberalization is relatively advanced. 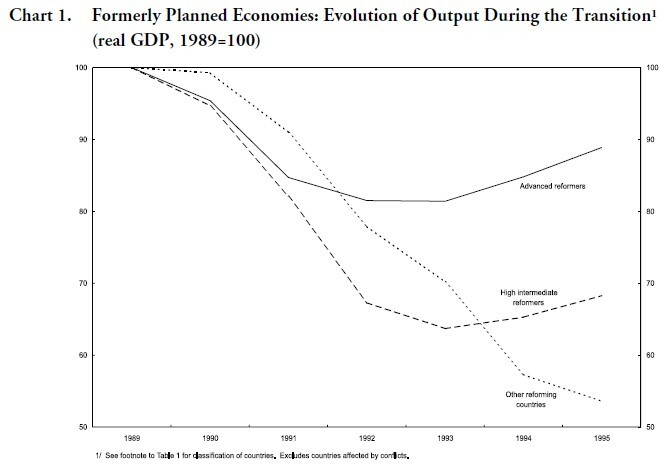 But it is unable to account for the initial decline in output that has accompanied liberalization in all the countries of Eastern Europe and the former Soviet Union, let alone for the fact that, initially, the drop in output tends to be steeper in those countries where the liberalization effort was the strongest. In this section, the assumption of zero net investment is retained4 but the assumption that the capital released by type-B enterprises can be immediately used by type-A enterprises is relaxed. Instead, it is assumed that this process takes time, not only because new firms must go through a learning process, but because much of the capital released by old firms must be extensively restructured to be effectively usable by type-A enterprises. This is the case even for those formerly type-B enterprises that transform themselves into type-A enterprises through restructuring (it takes time to shift production from periscopes to microscopes). It will now be assumed that only a fraction of the capital stock released by type-B enterprises can be put in place by type-A enterprises in any given year—the rest remaining temporarily unused—and that this fraction increases gradually as the process of economic liberalization matures.5 This hypothesis can be formulated by assuming that, in any given year, the ratio of capital put in place by type-A enterprises to the capital released by type-B enterprises is an increasing function of the number of years that has elapsed since the beginning of the transition. where the gradual restructuring variable Xt is an increasing function of the difference (t) between the current year (t) and the first year of reform (s + 1), and takes on values ranging between 0 and 1.
where a = aA/aB is the ratio of marginal products. Equation (7) has two terms. The first one reflects the growth of output of type-A firms and is positively related to: (i) the intensity of liberalization in the current year (Lt); (ii) the duration of the reform process (t, which is captured by the variable Xt); and (iii) the extent to which the marginal product of capital is higher in type-A firms than in type-B firms (a). Initially, the output of type-A enterprises is zero or negligible, but it increases over time because, as the reform process matures, new firms increasingly absorb the productive capacity idled as a result of past liberalization. The second term, (1- l Lt ), reflects the contraction in the output of type-B firms resulting from liberalization in the current period. In addition to liberalization, inflation has had a major influence on the evolution of output during the transition. The countries that have experienced relatively high inflation have registered a relatively large drop in output because the uncertainty and the chaotic conditions created by high inflation seriously complicate business decisions in general and encourage investment of effort and resources in unproductive activities directed only at seeking protection from price increases. Conversely, the elimination of hyperinflation should be expected to raise productivity by improving confidence and predictability and by discouraging wasteful activities. In addition, a substantial drop in inflation (following the initial and unavoidable price surge associated with decontrol) presupposes the implementation of measures that also help to enforce hard budget constraints and encourage inefficient enterprises to adjust. These measures— which include the reduction or elimination of budgetary transfers, subsidies and directed credits to inefficient enterprises—contribute to the fall in inflation, to restructuring, and also to a better allocation of financial resources. where Qt is the ratio of output in year t to output in the base year. The estimated equations also include a set of dummy variables (described in more detail below and in Annex 1) to control for the effects on economic activity of regional differences, armed conflicts, and other exogenous factors. Equation (11), which is similar to equation (10) but incorporates a vector of dummy variables Dit and a specific formulation of the variable X, was estimated using pooled time series/crosssection data for the period 1990-95 for the 26 former communist countries listed in Table 1. Regional dummy variables were included for the countries of the former Soviet Union and the Baltic region, for the Visegrad countries (Poland. Hungary, and the Czech and Slovak Republics), for the former Yugoslav Republics (Slovenia, Croatia, and Macedonia FYR), and for the other countries of Eastern Europe (Bulgaria, Romania, and Albania). The DFSU variable had been included by Aslund, Boone, and Johnson (1996) in their cross-section regressions under the heading of “Ruble Area” dummy. This is a misnomer, however, since most of the Baltic and former Soviet Republics left the ruble area at various times beginning in 1992. Accordingly, a proper ruble area variable was constructed with values equal to one for each original member of the ruble area before the introduction of a national currency (or the introduction of a general-use coupon as legal tender), and to zero otherwise. The coefficient of this variable was expected to be negative in view of the propensity of some countries to export inflation to other members of the ruble area in 1993-93 and of the conflicts between Russia and certain other countries regarding the use of ruble correspondent accounts held with the Central Bank of Russia by other central banks. Another variable (Dcom) was introduced to capture the length of time a country has operated under a communist system, as suggested by Ickes (1996). Its coefficient was expected to be negative because the length of this period should be associated with more deeply entrenched central planning mechanisms and a more distorted economy. The dummy variable Dwar was introduced to capture the direct or indirect economic effects of regional conflicts in several countries at various points during the sample period, and the variable Dnr was used to test whether economic activity in those countries rich in natural resources had been relatively less affected by the problems of industrial restructuring than in other countries in transition. Finally, a variable (Dfixed) proposed by Fischer, Sahay, and Végh (1996) was used to capture the (presumably) positive effects on economic activity of fixed exchange rate systems. In column (A) of Table 2a, all the coefficients have the expected signs and are significantly different from zero,8 with two exceptions. First, the variable representing the number of years in which the country has been under communist rule (Dcom) has the wrong sign, perhaps because the impact of that variable is already reflected in the liberalization index, as suggested by the results presented in Annex 2. Second, the coefficient of the ruble area variable is insignificantly different from zero. These two dummy variables are dropped from the other regressions presented in Table 2, with minor effects on the results. It is noteworthy that coefficients of inflation and of the two liberalization variables (L and LX) are significant in spite of the collinearity among these three variables. This suggests that Aslund, Boone, and Johnson’s (1996) finding that the (cumulative) liberalization variable becomes insignificant when they add two dummy variables (DFSU and Dwar) to the list of regressors probably reflected an insufficiently complete specification (the authors were limited in terms of degrees of freedom as they were using crosssection data only). 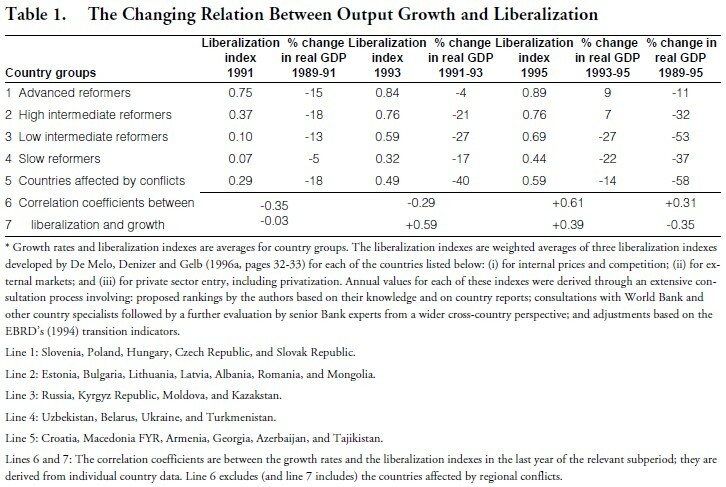 In a comment addressed to Aslund, Boone, and Johnson (1996), Ickes (1996) argued that the use of the cumulative liberalization index is inappropriate because if two countries have achieved exactly the same degree of liberalization, the one that started the process earlier would achieve a higher score. However, this seems to miss the point that, in explaining the evolution of output during the transition, both the intensity and the duration of the process of liberalization matter. Indeed, De Melo, Denizer, and Gelb (1996) used the cumulative liberalization index precisely to summarize these two dimensions of the process in a single number. This point is also recognized by Selowsky and Martin (1996) who used current and lagged values of the noncumulative liberalization variables to capture the effect of duration. 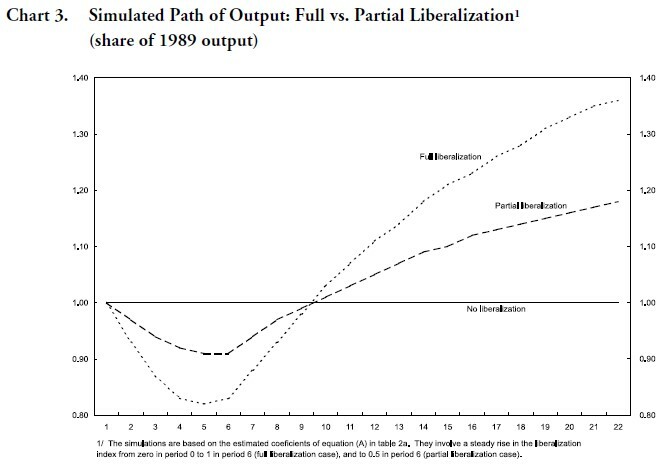 The present paper also uses the actual rather than the cumulative liberalization index, but it models explicitly the interaction between the intensity of liberalization, the duration of the transition process, and the evolution of output. In columns (A) through (D) the coefficient of the gradual restructuring variable (al) ranges approximately between 0.9 and 1.2, and the coefficient of the (unmodified) liberalization variable (l) ranges between 0.3 and 0.4. On that basis, the range of estimates of a falls between 2.6 and 3.6 — i.e., new enterprises are roughly 2½ to 3½ times more productive than old enterprises. Of course, these results must be interpreted with caution because the estimates of a seem vulnerable to changes in specification, because there are serious problems with the output data (see below), and also because there may be questions about the liberalization variable which, although it was based on the careful judgment of World Bank experts, was not derived from direct measurement.9 It should also be noted that the present model imposes the same ratio of marginal productivities and the same speed of restructuring to all countries. Thus, the estimated coefficients reported in Table 2 are averages of individual country coefficients that in fact may differ significantly among each other in ways that are not fully captured by the dummy variables included in the regressions. The results shown in columns (A) through (D) of Table 2b confirm that armed conflicts have had a large adverse effect on output, reducing cumulative growth from 1989 to 1995 by 11 to 16 percent in the countries affected relative to the other countries in the sample. However, other results, discussed below, suggest that conflicts may have affected measured output more severely than actual output. The regional variables also had appreciable effects: other things equal, cumulative growth may have been raised by 3 to 9 percent in the Visegrad countries, lowered by 1 to 7 percent in the other countries of Central and Eastern Europe, and raised by 5 to 7 percent higher in the countries with abundant natural resources. The results in columns (A) and (B) imply that, other things equal, output may have been about 10 percent lower in the countries of the former Soviet Union and the Baltic region, but the results discussed below suggest that this may have been partly a statistical mirage. Column (C) shows the results of replacing the regional dummy DFSU by a set of subregional dummy variables. The estimated coefficients of these variables suggest that, ceteris paribus, output may have been 6 percent lower in the Transcaucasian countries, 4½ percent lower in the Baltic countries, but almost 5 percent higher in the former Soviet Republics of Central Asia relative to other countries in the sample. 10 However, the standard errors of these estimates are relatively high. The estimated coefficients of other variables do not change much in comparison with columns (A) and (B), except that both the size and the t ratio of the war dummy coefficient falls, perhaps because it now competes with the dummy variable for Transcaucasia, a region including three countries that were seriously affected by armed conflicts during the period. In column (D), the regional dummies are replaced by a set of country dummies. The results broadly confirm those discussed above for regional aggregates but also indicate that, other things equal, output was particularly weak in Georgia, Moldova, and Lithuania, and particularly strong in Poland and Slovenia. Columns (E) and (F) illustrate the sensitivity of the results to two kinds of changes in specification. In column (E), the inflation variable is dropped and replaced by a time trend—which might be loosely justified on the ground that the productivity of the inherited stock of capital diminishes over time. The coefficient of the trend variable turns out to be significantly negative and the signs and significance of the other coefficients are unchanged, suggesting that the inflation variable may, to some extent, be picking up the effects of gradual obsolescence of old plant and equipment. However, the estimated size of a is not credible. When both inflation and the time trend are included in the equation the first variable is highly significant, while the latter is not. When both variables are dropped from the equation, the other variables remain correctly signed and significant, but the overall explanatory power of the equation drops substantially. where u is the number of years required to achieve half of the adjustment.11 The results are not drastically altered, except that the productivity gap between type-A and type-B goods is substantially narrower than in the other equations. Finally, the coefficient of the variable Dfixed suggests that output may have been 1 to 4 percent higher in the countries that adopted a fixed exchange rate, but the coefficient of this variable was not significantly larger than zero in most regressions. Some qualifications are in order, however. First, it is possible that the positive impact of fixed rate regimes on output occurs indirectly through the inflation variable. This conclusion is supported by Fischer, Sahay, and Végh’s finding that countries with fixed rates have experienced relatively low inflation, and by the results in Table 2 which show a strong, inverse correlation between output and inflation. It is also consistent with the fact that the coefficient of the fixed rate dummy rises (and its standard error falls) when the inflation variable is omitted from the equations. Second, however, these results do not necessarily confirm Fischer, Sahay, and Végh’s claim that nominal exchange rate anchors per se improve economic performance. It is possible that the causality runs in reverse order, and that those countries that had achieved a sufficiently high degree of institutional development and political consensus for stabilization found it possible to peg the exchange rate. Chart 2 illustrates the effect of liberalization on the production of type-A and type-B goods during the transition. The sectoral breakdown of output between new and old firms—which is, of course, unobservable— is derived by simulating equation (A) in Table 2,12 where the variable X is equal to the logarithmic- reciprocal function exp(-q/t). The proportion of available capital put in place by type-A firms is zero for t = 0, rises gradually with the passage of time, and approaches 1 asymptotically as t increases. In the first two years, the contraction of aggregate production is much steeper for the strong reformer than for the slow reformer because the pace of liberalization is faster, and therefore the fall in the output of old goods is sharper in the former country. In the third year, however, positive growth resumes in the strong reform country reflecting the gradual pickup in the output of new goods as the liberalization process matures. In the slow reform country, the fall in output initially is less abrupt but it is more prolonged, while the recovery is much slower because the growth in the output of type-A goods is relatively low and the share of the less productive type-B enterprises in total output remains much higher. Beginning in the sixth year, output in the strong reformer exceeds output in the weak reformer by a margin that rises as liberalization takes hold. Table 2a provides estimates of several key parameters of the model, including the number of years required for output to return to its pre-reform level (the crossover point). Except in equations (E) and (F), output is estimated to return to its initial level after approximately 9 to 11 years, although for a particular country the period can be shorter or longer depending on the sum of coefficients of the corresponding dummy variables. Abstracting from the effects associated with dummies, the number of years required for output to return to its pre-reform level is equal to the adjustment parameter q divided by the logarithm of the relative productivity ratio a.13 It is therefore independent of the level of Lt although, of course, the earlier liberalization starts the sooner will recovery be complete. 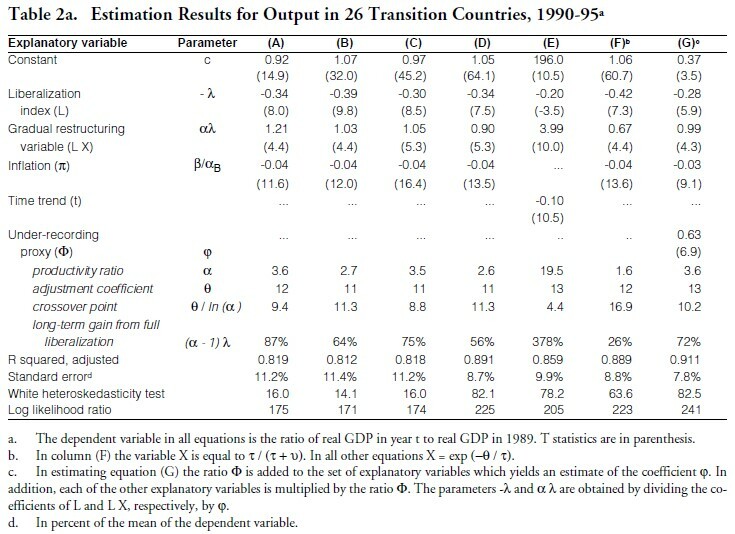 If liberalization is complete (L = 1) the percentage deviation between long-term and base-period output is simply l (a – 1); in Table 2 this deviation is estimated to range between 56 percent and 87 percent.14 Chart 3 illustrates the relation between long-term growth and liberalization by comparing two countries that achieve full liberalization (L = 1) and partial liberalization (L = 0.5), respectively. These levels are assumed to be attained in five years, after which no further changes in liberalization take place. The chart confirms that output falls during the period of liberalization15 (as L rises from zero to its steady-state level) and that the fall is steeper in the country that achieves complete liberalization. After the contraction ends, however, output rises much faster in the country that achieves full liberalization, and that country attains a much higher level of output in the long term. Chart 3 does not imply that everyone will benefit from full liberalization. Some may prefer to forgo the substantial, long-term output gains for the sake of avoiding the short-term contraction of output—for example, if they are old and care little about the next generation, or if liberalization means the end of the political and economic privileges they enjoyed under the old regime. But the large dividend paid by full liberalization makes the concept of a short-term sacrifice for a long-term gain appear quite attractive, particularly in view of the evidence that increased economic liberalization also is associated with greater political freedom. The picture in Chart 3 also suggests that some consumption-smoothing would make sense. 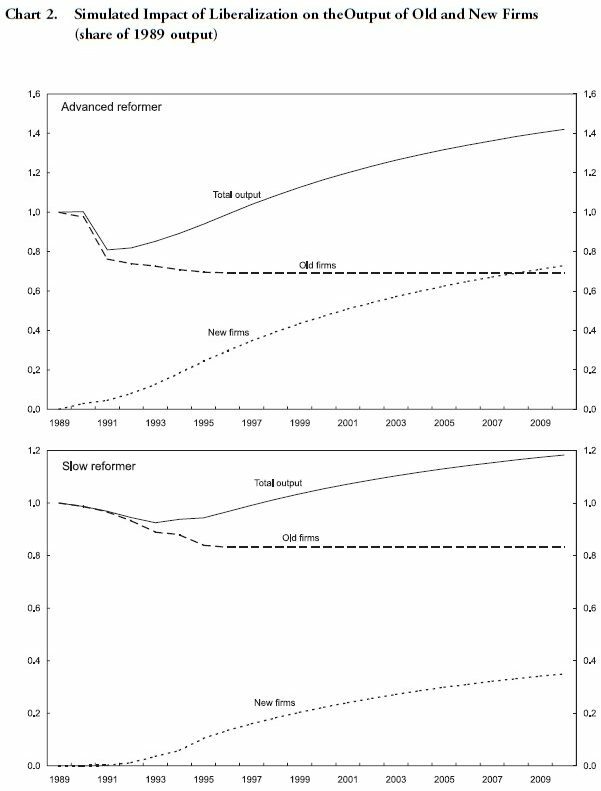 It might be argued that private consumption and the social component of government spending could be prevented from falling too sharply during the period of output contraction by running fiscal deficits financed by issuing domestic bonds and thus crowding-out domestic investment temporarily—after all strong, productivity-led growth is likely to occur anyway as a result of restructuring—or by borrowing from abroad. However, it remains to be seen how far this policy can be pushed without leading to an unsustainable accumulation of debt and eventually to a financial crisis, particularly in situations where initially low credibility is likely to boost the cost of borrowing. As indicated earlier, it has been strongly suspected for some time that the official national accounts data in the countries in transition underestimate the output of new enterprises and therefore total output by a substantial margin, and that the degree of overestimation is particularly large in the countries of the former Soviet Union. 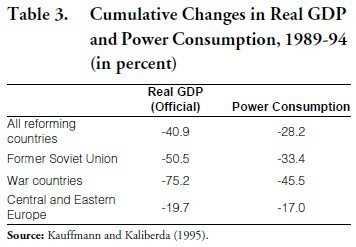 In recent papers, Kauffmann and Kaliberda (1995) and Dobozi and Pohl (1995 and 1996) have observed that electric power consumption, a good proxy for output in most developed market economies, has declined significantly less than real GDP since the beginning of reforms, and that while the gap between the two variables has been relatively small in Central and Eastern European countries, it has been very large in the countries of the former Soviet Union (see Table 3). The authors do not find any convincing explanation for these results16 other than an indication that the official GDP statistics overstate the true fall in output because of: (i) attempts by enterprises to avoid high taxes and residual state orders to supply goods at regulated prices; and (ii) the failure of official national accounts systems to keep up with the growth of new activities, particularly in the small-scale service sector. They proceed to construct indexes of power consumption that they regard as more reliable indicators of the evolution of actual output than the official GDP numbers. In order to correct at least in part for the under-recording of output by the official data, it was assumed that the ratio of officially measured output (Q) to true output (QT ) was proportional to the ratio F of measured output to power consumption. where bars on top of the variables indicate indexes based in 1989. Since the right-hand side of equation (11) seeks to explain true output, it can be substituted for Qit T in equation (15). This provides a simple way to correct for the underestimation of output in the official GDP numbers: to multiply the constant term as well as each explanatory variable in equation (11) by the ratio Фit and to run the regression using the transformed variables.17 The results are shown in column (G) of Table 2a. The coefficient of the variable Ф is significantly positive and suggests that, on average, almost two thirds of the gap between changes in measured real GDP and changes in power consumption reflect under-recording of output. This would mean that the average contraction of real GDP in the countries of the former Soviet Union during 1989-94 would have been a little less than 40 percent, compared with more than 50 percent indicated by the official estimates. The results in column (G) also show a drop in the coefficient of the war dummy compared with previous equations, perhaps because the incentive to under-report production is relatively high in war situations. 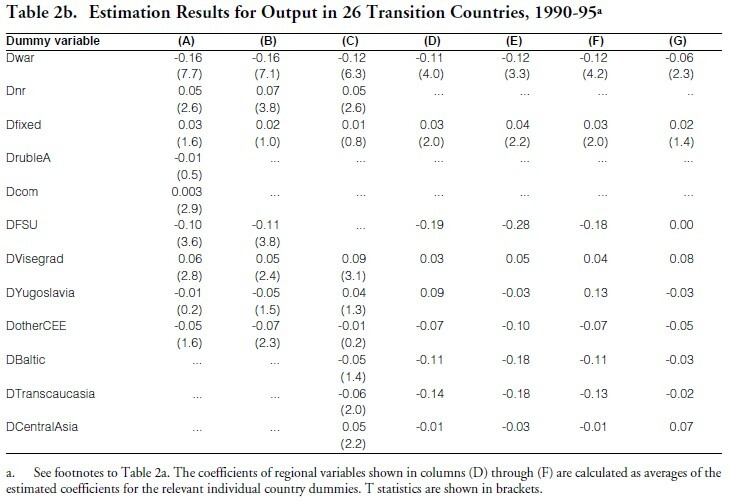 Finally, it is noteworthy that the sum of coefficients of the dummy variables for the FSU countries drops to zero, suggesting that the major difference between countries of the former U.S.S.R. and other reforming countries—other than those differences already captured by other explanatory variables in the model—has been the under-reporting of output. The results presented in this paper indicate that the transition from central planning to a growing market economy is almost unavoidably arduous—un mauvais moment à passer. It is also probably fairly long, taking as much as a decade, or more. This is not particularly surprising given the extraordinarily difficult circumstances inherited from the old regime, including heavily distorted price systems and trade patterns, and overly large industrial sectors often unprofitable at the new, much freer structure of relative prices. In particular, the results suggest that it takes considerable time to restructure the capital stock inherited from the previous system and use it in the productive process. While this process of restructuring takes place, part of the usable capital stock is temporarily unemployed, leading to a contraction of total output. During this period of transitional unemployment, the structure of the economy changes: the old firms cut production as the economy is liberalized, releasing resources that are used partially and gradually by the new enterprises. Thus, an aggressive policy of liberalization will lead to a comparatively rapid contraction of the old enterprise sector and a relatively sharp initial drop in total output. But it will also make room quickly for the new, more profitable enterprises, and set the stage for a much higher level of income in the medium term. For those countries that have embarked audaciously in the process of liberalization, the light at the end of the tunnel is now clearly visible. The worst is over as much of the old sector has disappeared or transformed itself, and the new sector gradually increases its share in the economy. As a result, most countries of Central and Eastern Europe, the three Baltic countries, Mongolia, and some countries of the former Soviet Union, like Armenia, Georgia and the Kyrgyz Republic, experienced positive growth in 1995 and probably also in 1996. It is true that measured real GDP remains well below 1989 levels in many countries, but this gap is probably exaggerated by the official data which, as suggested by the empirical results presented in this paper, underestimate the true level of production by a wide margin, particularly in the countries of the former Soviet Union. Moreover, the prospects for growth among the strong and early reformers appear to be quite good, because from now on new investment will go into the new enterprises and contribute rapidly to economic expansion. In those countries that have been slow in adjusting, the contraction of the old industrial sector has been relatively gradual. But the bad news is that much of this sector remains in place, and much of the unavoidable task of liberalization and restructuring remains ahead. Output in these countries is still falling, even though many of them, like Azerbaijan, Uzbekistan, and Turkmenistan, have been blessed with a wealth of natural resources. For these countries, and also for those like Cuba and North Korea, where centralized control is still the principal mechanism of resource allocation, the advice is to move on as soon as possible with full liberalization. The alternative path—to support the monuments to inefficiency built by the old regime—promises nothing but blood and tears. The empirical results of the model strongly confirm the finding of previous studies that there is a close association between price stabilization and the resumption of growth. The results also confirm that armed conflicts have hindered economic activity in various countries in transition (although this may have been more a feature of the data than of reality) and that regional differences have been of some importance. However, there is no clear evidence that the counties of the former Soviet Union have performed significantly worse than the average after controlling for differences in the timing and intensity of liberalization, price stabilization and under-reporting of output. In particular, the evidence does not support the hypothesis that membership in the ruble area contributed to an exceptionally difficult transition. Finally, the results provide some—but not much— support for the view that fixed nominal exchange rates have contributed directly to a relatively strong performance of output, although they may have contributed indirectly to this result by helping to bring down inflation. 1. The author would like to thank Robert Corker, David Coe, Martha De Melo, and Ratna Sahay for their very helpful comments on previous drafts and Yutong Li for her assistance. 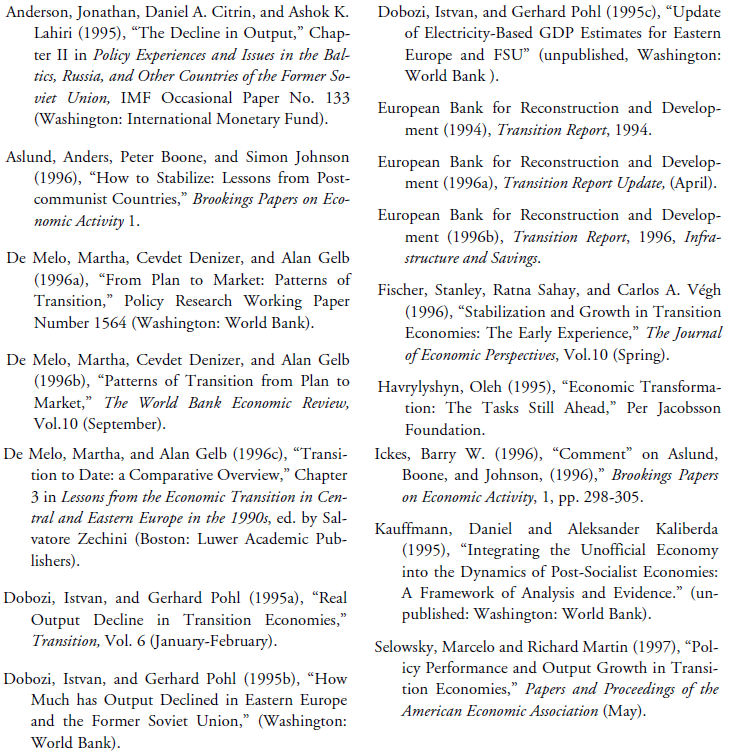 This paper was originally published in IMF Staff Papers and is reprinted by permission. 2. See Aslund, Boone, and Johnson (1996), De Melo, Denizer, and Gelb (1996), De Melo and Gelb (1996), Fischer, Sahay, and Végh (1996), Havrylyshyn (1995), and Selowsky and Martin (1996). 3. In contrast, China and Vietnam never experienced a contraction of output, for reasons that include the relatively small size of the industrial state sector in these countries and hence the comparatively less burdensome task of restructuring; a considerably lower degree of integration in the CMEA; and the fact that central planning mechanisms in China and Vietnam had been less deeply ingrained than, for example, in the countries of the former Soviet Union. On this issue, see De Melo and Gelb (1996). 4. This is a major simplification, but one which allows the analysis of important aspects of the reform process (such as changes in unused capacity) to proceed within a tractable model, and without requiring data on net fixed capital formation which are unavailable in many of the relevant countries and are of dubious quality where available. The assumption of zero net capital formation is probably not very unrealistic in the context of the early transition from plan to market (say the first six to eight years). It is, of course, unsuitable for the longer term when the growth of capacity (as opposed to changes in its degree of utilization) play the more important role in explaining growth. 5. The model could be extended by allowing a fraction 1-g of the old firm’s initial capital stock to be hopelessly obsolete. In that case, the right-hand side of equation (5) would have to be multiplied by g, i.e., by the fraction of the initial stock of capital that does not have to be discarded and is potentially usable by new firms. 6. Other explanations have been given for the decline in output, including the collapse of export markets following the dissolution of the U.S.S.R. in 1991, the loss of transfers from the Union in some former Soviet Republics and the negative multiplier effects of antiinflationary financial policies—although the results obtained in this paper suggest that this latter hypothesis is unconvincing. (See Anderson, Citrin, and Lahiri (1995) for an examination of various explanations.) In addition, there are reasons to believe official GDP figures overestimate the fall in output in the countries of the former Soviet Union by a considerable margin. This issue is examined below. 7. The application of the model underlying equation (10) raises a particular problem on the case of the three former Yugoslav Republics included in the sample. In these countries, economic liberalization had started as early as 1965; by 1989 the process was already quite advanced and the De Melo-Denizer-Gelb index already had reached 0.41. This would make for higher level of productivity and per capita output in these countries compared with all the other countries in the sample, but it would not affect the growth of output in the 1990s relative to a base period in 1989—and this is what is measured by the dependent variable Q. To avoid the bias that would have resulted otherwise, the liberalization variables for the three former Yugoslav Republics was defined in terms of deviations from the level of that variable in 1989. 8. All statements about significance are based on one-tailed t-tests and a 1 percent confidence interval. With an infinite number of degrees of freedom, a positive value of t larger than 2.33 has a probability of 1 percent. This applies approximately to the equations reported in Table 2, where the number of degrees of freedom is 156. 9. It is noteworthy, however, that the De Melo-Denizer-Gelb liberalization index is strongly correlated to the share of the private sector in the economy and also to the EBRD and the IMF measures of institutional development. See Aslund, Boone, and Johnson (1996). 10. The precise composition of these country groups is provided in Annex 1. 11. X was also approximated by other functional forms, including the square root of t and the logarithm of t, with similar results but larger standard errors. 12. It is important to note that the simulations underlying Chart 2 are intended to capture the impact of liberalization on output with other variables remaining unchanged. If the impact of inflation in 1989-95 were taken into account, the fall in output would be larger in both countries, and particularly in the slow reform countries (typically, strong reformers also have succeeded in bringing down inflation more quickly than slow reformers). The simulations underlying Chart 2 use actual data for a strong reformer (the Czech Republic) and a slow reformer (Belarus) from 1989 through 1995; and projections thereafter. 13. This result holds for the logarithmic-reciprocal version of Xt. In the case of the ratio form used in equation (F) of Table 2a, the number of years needed for output to return to its initial level is equal to (q – a )/(a – 1). 14. Excluding the outliers in columns (E) and (F). 15. Except, of course, if there is no liberalization, in which case output never changes. 16. Indeed, they note that the large rise in electricity prices that has occurred in these countries should have led to a fall in the ratio of power consumption to GDP. 17. For an alternative way to adjust for under-reporting, see Selowsky and Martin (1996).